LifeWay Research has published a survey of 1,000 American Protestant pastors on the issue of evolution. 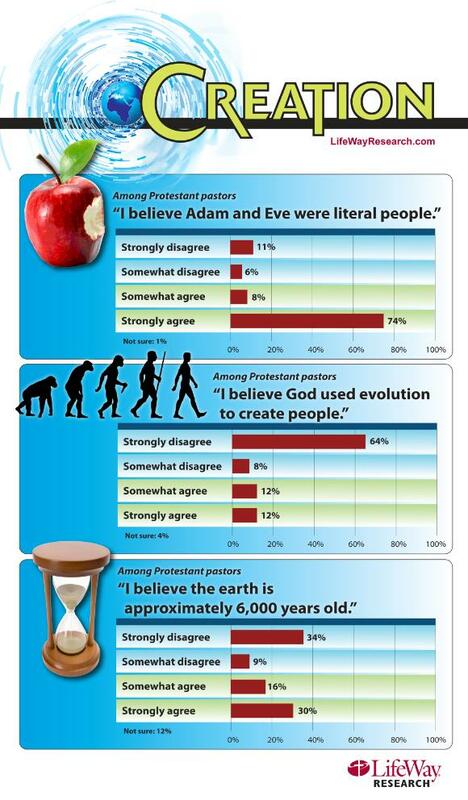 The survey asked pastors whether they believe God used evolution to create people, the age of the earth, and whether Adam and Eve were real people. NASHVILLE, Tenn. – Pastors overwhelmingly believe that God did not use evolution to create humans and think Adam and Eve were literal people, according to a recent survey by LifeWay Research. When asked to respond to the statement, “I believe God used evolution to create people,” 73 percent of pastors disagree, with 64 percent strongly disagreeing and 8 percent somewhat disagreeing. Twelve percent each somewhat agree and strongly agree. Four percent are not sure. In response to the statement, “I believe Adam and Eve were literal people,” 74 percent strongly agree and 8 percent somewhat agree. Six percent somewhat disagree, 11 percent strongly disagree and 1 percent are not sure. Based on a Gallup poll from December 2010, pastors are more Creationist (referring to the belief that all things were created substantially as they now exist as recounted in the first chapter of Genesis and not gradually evolved) than the American public at large. Forty percent of Americans believe God created humans in their present form, 38 percent say God used evolution to develop humans and 16 percent think man evolved with God playing no part in the process, according to Gallup. In the LifeWay Research survey, about one in five pastors agree that most of their congregation believes in evolution. That includes 10 percent who strongly agree and 9 percent who somewhat agree. A majority (62 percent) strongly disagree and 13 percent somewhat disagree. Only a third of pastors (36 percent) teach on creation and evolution more than once a year. That includes 28 percent who teach on the subject several times per year, 4 percent who teach on it about once a month and 3 percent who do so several times a month. Twenty-six percent teach on it about once a year, and 29 percent do so rarely. Eight percent never teach on creation and evolution. In response to the statement, “I believe the earth is approximately 6,000 years old,” 34 percent of pastors strongly disagree. However, 30 percent strongly agree. Nine percent somewhat disagree, and 16 percent somewhat agree. Read the article in its entirety by visiting LifeWay online. When It comes to the issue of the Bible and evolution, I have already made my views known. You can read where I stand on whether committed Christians can be faithful to the teachings of the Bible and still believe in evolution by reading my post, The Bible and Evolution. As for the age of the earth, it is amazing that so many Christians still believe that the earth is 6,000 years old when the scientific evidence shows that the earth is much older than that. Maybe one of these days I will have to write a post to explain how Christians came to believe that the earth is only 6,000 old. Those who know the background of this date also know that this date is unreliable. This entry was posted in Creation, Evolution and tagged Creation, Creationism, Evolution. Bookmark the permalink. Well I understand the 6000 years is all based on Ussher’s 17th century calculations per genealogy etc lists in the Bible. It is pleasing as although he came up 4004 BC he did say 23 October which many years later was my birth day but if course actual calendar days have changed. And then if we can accept the years for births to arrive at his calculation we then have to accept the Day in Genesis as being 24 hours – Answers in Genesis people are very strong on the 24 hours. But I am not at all clear that is what Genesis is saying. So your analysis of why it has come to 6000 will be most interesting…. But you already have the answer. Ussher’s calculation is what is behind the 6,000 years. He followed the ages according to the genealogies and came to the conclusion that the world was created in 4004 B.C. Thus, the 6,000 is a way to prove that the numbers mentioned in the genealogies must be taken literally.